During the 2017-2018 academic year, Tulane University released the Climate Survey results, which highlighted the fact that sexual violence is a too common experience for many Tulane students and requires more focused intervention. This past June, a group of faculty, staff and students from Campus Health, Title IX, Student Conduct, the Office of Institutional Research, Fraternity & Sorority Programs, and the School of Public Health and Tropical Medicine met to strategically plan and lay a new foundation for sexual violence prevention at Tulane. This implementation team reviewed data from the Climate Survey, the 2016 National College Health Assessment, and the Expert Panel recommendations. During the review it became clear that Tulane had comprehensive response and care initiatives in place through departments including Title IX, Case Management and Victim Support Services (CMVSS), Student Conduct, and CAPS. However, more was needed to prevent sexual violence. A number of new initiatives and projects were planned, developed, and implemented this past semester. We want to highlight a few of these accomplishments. New coalitions were implemented to provide new engagement opportunities for the Tulane community. Tulane’s Coalition to Stop Sexual Violence is a group of faculty, staff, and student representatives who meet regularly throughout the year. This coalition works to create a strong network of campus partners who have a breadth of knowledge about sexual violence issues impacting the Tulane community. This network actively engages in and promotes community initiatives that prevent and respond to sexual violence. It has met twice this year and has approximately 40 members. The Student Coalition for Sexual Violence Prevention and Response is a diverse group of students representing various student groups from across campus who meet monthly to engage in conversation and plan new student-driven initiatives around sexual violence prevention and response. This year they are leading the planning for Sexual Assault Awareness Month (April). It has met three times and has more than 20 members. The Office of Fraternity and Sorority Programs hired a new Assistant Director for men's education. Campus Health hired a practitioner to develop a new office focused on alcohol and other drugs, which will assess and intervene with medium- and high-risk drinkers. The Well for Health Promotion is in the process of hiring a Senior Health Promotion Specialist who will work on addressing the needs of graduate and professional students. The All In website is the new “home” of information and resources regarding sexual violence. This website includes information about how to get involved, how to report incidents of sexual violence, and how to support someone who has experienced sexual violence. The website includes information for students, parents and families, and faculty and staff. You can also sign up for the monthly e-newsletter. We encourage you to visit allin.tulane.edu to learn more. Almost 500 individuals subscribed to receive the All In e-newsletter during autumn semester. The Well introduced several social marketing communication pieces, including the “Know Your Power” campaign. The Office of Student Conduct implemented a "Know the Code" campaign to increase awareness of sexual misconduct and the interaction with the Student Code of Conduct. Finally, a Sexual Respect Safety Card is now available at Campus Health and across campus, to provide each student with information on sexual violence, sexual health, and healthy relationships. This semester, the Tulane Peer Health Educators (TUPHEs) completed 26 One Wave workshops with 1,061 students participating. Moving forward, several new curricula have been launched or are in development. The Well has developed a new consent and respect workshop, the Consent Conversation, that will be available as a part of the Live Well Series and by request. Members of the implementation team, which include includes staff from Campus Health, Title IX, Student Conduct, the Office of Institutional Research, Fraternity & Sorority Programs, and the Office of Multicultural Affairs, are currently developing additional programs including new programs on sexual health consent, the basics of sexual violence, and a training specifically for student employees and student leaders. A new TIDES Anchor on sexual violence prevention is now available for TIDES instructors. This spring, a new 8-week men’s mentoring program will be offered as a pilot project. The team is actively engaged with researchers to work with Tulane staff, faculty, and students to learn how to better meet the needs of our students of color and LGBTQ+ students. Dan Tillapaugh and Jordan West visited campus this Fall and will return during the spring semester to meet with additional participants. A sexual health/sexual respect communication campaign to increase knowledge, and address attitudes and behavior. A guide for faculty on how to respond to students regarding sexual violence. An identity curriculum to help students explore personal identity and understand others'. Assessing the feasibility of a social norms campaign targeting the Greek communities around alcohol and sexual violence. Implementing standardized online training for all graduate and professional students on sexual violence. Roleplay, the theatrical performance, will present a work-in-progress reading on campus on Monday, April 15, to coincide with Sexual Violence Awareness Month. The full production is tentatively slated to run the first two weeks of school fall 2019, Aug. 29-Sept. 8. Coordinating a meeting about Victim Services to review and identify opportunities for improvement. If you have questions about Tulane’s sexual violence prevention plan or about any of the new initiatives, please reach out. You can contact us on the All In website. Please use the form to share your interest in getting involved with All In or your ideas about how we can end all sexual violence. Include an email address if you would like someone to follow up with you. In Tulane’s 2016 climate survey, 28.6% of full-time students reported experiencing stalking during their time at Tulane. Although people often casually use the term to describe behaviors like looking at someone’s social media profile, stalking is a crime and is prohibited by Tulane’s Code of Student Conduct. According to Tulane’s Code, “stalking occurs when a person engages in a course of conduct directed at a specific person under circumstances that would cause a reasonable person to fear bodily injury or to experience substantial emotional distress.” Similarly, cyberstalking, or using electronic means to stalk someone, is prohibited under Tulane’s Code and Louisiana law. Tulane encourages victims of stalking and cyberstalking to reach out to the one of the many resources available at Tulane and in the New Orleans area. Counseling services are available for free on-campus at CAPS and off-campus at the Family Justice Center. The Family Justice Center also provides legal advocacy, including assistance filing for a protective order in civil court. Staff at Case Management and Victim Support Services (CMVSS) can assist students in connecting with resources and accommodations, such as housing and academic accommodations. They can also help students understand their options for filing a report with the Office of Student Conduct and with law enforcement. CMVSS and Student Conduct can also issue a no contact order between two students, prohibiting any further contact. Tulane’s Police Department can assist with safety concerns through safety escorts, safety planning, and other non-criminal measures, in addition to assisting a student with the criminal reporting and investigation process. Finally, after-hours support is available through several on- and off-campus resources and hotlines. In each issue of All In, we feature the scholarship and leadership of one of the many Tulane faculty members working on issues of sexual violence. 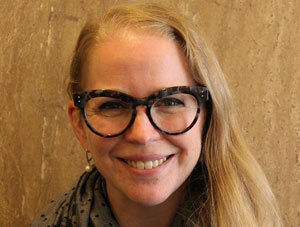 This month, Aubrey Spriggs Madkour, Associate Professor in the School of Public Health and Tropical Medicine, talks about her work, including her research on dating violence among New Orleans adolescents. I am a faculty member in Global Community Health and Behavioral Sciences at Tulane School of Public Health and Tropical Medicine. My broad research area is adolescent and young adult health, with particular foci on sexual and reproductive health, dating violence, and substance use. I have conducted studies examining predictors and consequences of early sexual initiation among adolescents; determinants of longitudinal trajectories of dating violence between adolescence and early adulthood; adolescents’ perceptions of dating violence definitions and etiology; and most recently, causes of substance use behaviors in early adulthood. When I first came to Tulane in 2009, one of my first projects was examining trends in violence-related behaviors among high school students pre- to post-Katrina. This project was inspired by anecdotes that youth post-Katrina were more violent and volatile than pre-Katrina. In that analysis, I found that although there was not a spike in violence-related behaviors post-Katrina among school-attending youth, there was a large increase in dating violence victimization prior to Katrina that was maintained afterwards. Shockingly, the ending prevalence was twice the national prevalence, and substantially higher than other comparison areas (i.e., Baltimore, MD, and Detroit, MI). To further explore this, I initiated a small qualitative project interviewing 38 high-school-aged youth in two high schools. Youths expressed that they believed dating violence stemmed from lack of communication skills between partners, jealousy, and poor role modeling for violence at home. Teens largely defined dating violence based on physical violence perpetrated by a male against a female partner. Although many viewed other female-perpetrated behaviors or emotional abuse as problematic, they often were not viewed as rising to the level of “dating violence.” This suggests some normalization of unhealthy relationship behaviors, including ones that may be precursors to physical violence. When queried about victims’ help-seeking behaviors, many youth expressed reticence going to formal sources of support. While teens expressed adults (especially professionals) may be more effective at making dating violence stop compared to peers, they believed most victims would prioritize their own privacy and maintaining their romantic relationship. I recently finished an NIH-funded project to examine the course over time of binge alcohol use in early adulthood, including predictors of variability in those trajectories. I used data from both a national survey of young adults, as well as locally collected data from 18-19 year old African American young women. Findings suggested that having a male sexual partner was associated with increased risk for substance using behaviors (alcohol and marijuana) among young women. Racial discrimination was also associated with increased binge alcohol use, especially around the ages of 19-20, for both males and females. In contrast, maintaining close, communicative relationships with parents in early adulthood was associated with decreased risk, for both males and females. Given the link between substance use and perpetration of sexual violence, we believe further studying contextual factors that give rise to substance using behaviors among young adults is important to informing potential environmental interventions to reduce both substance use and sexual violence risk. Another project that is currently in the analysis phase is a qualitative inquiry into young adults’ pathways into heroin use. This study was financially supported by the Louisiana Board of Regents. For this project, I worked with Dr. David Seal as well as a number of Masters and undergraduate students. We recruited young adults from the local syringe exchange program run by Crescent Care. Young adults spoke with us about their lives before heroin initiation, precipitating factors that led to initiation, their first experience with heroin, and how their lives have changed since first heroin use. Data is still being analyzed, and we expect findings to be ready for dissemination by summer. Preliminary results suggest that the pathway into heroin use most frequently discussed in the popular media (i.e., via medically supervised use of prescription opioids) is by no means universal. Many of the young adults we spoke with were polydrug users prior to using heroin, and had experienced significant earlier life traumas which fed into their drug use pathways. We believe results will inform public health interventions that are meant to address the heroin crisis among young adults. Moving forward, I aim to further explore how neighborhood environments and place-based exposures impact substance use by young adults. In collaboration with a number of other faculty members, I am writing grants for projects to understand how the places young adults are exposed to during daily activities impact substance using decisions. We hope that such knowledge can then inform contextual interventions that impact risky substance use and its sequelae. 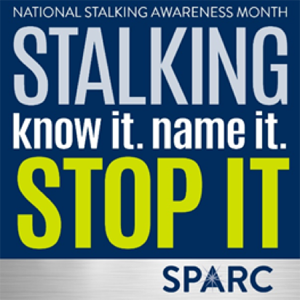 In recognition of January being Stalking Awareness Month, take some time to read about research on stalking. Learn more about the connection between drug and alcohol use and stalking and about stalking among LGBTQ adults in the Journal of Interpersonal Violence. In Communication Research, examine how media depictions of romantic pursuit and stalking impact our attitudes towards stalking. And, read in Cyberpsychology, Behavior, and Social Networking about how social media can be used to engage in stalking. Looking at representations of women in media, New York Times film critic Manohla Dargis reflects on What the Movies Taught Me About Being a Woman and What It’s Like to Be a Female Movie Critic in the #MeToo Era. 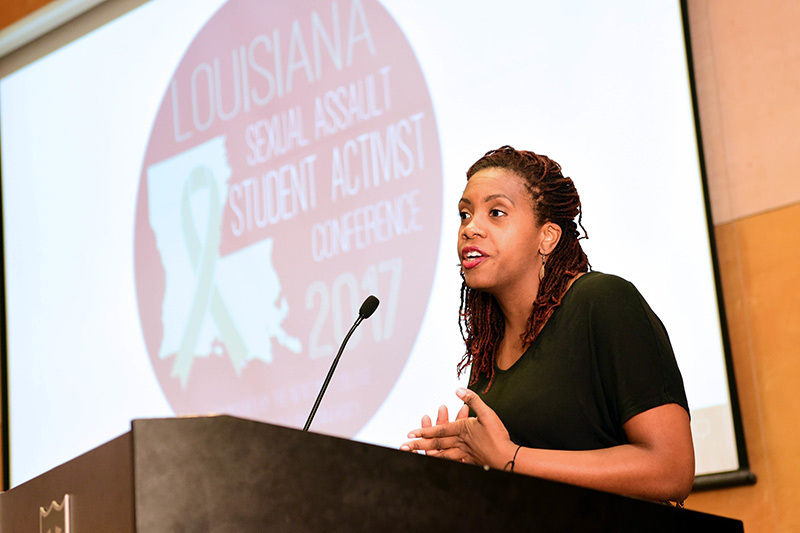 This student-run conference provides a venue for sexual assault activists from across Louisiana to gather to learn from local and national experts and to share their experiences about sexual assault activism on their college campuses. Registration is now open at the above link.